Designed for adults to ride on. 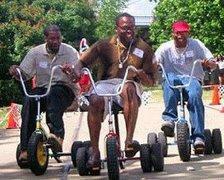 Pricing is per tricycle...Set up cones or markers to create wacky race course. Holds up to 250 lbs each.